How far to the right could Brazil’s new leader take the country? © REUTERS/Sergio Moraes A supporter of Brazil's new president-elect, Jair Bolsonaro, celebrates in front of Bolsonaro's condominium at Barra da Tijuca neighborhood in Rio de Janeiro, Brazil October 29, 2018. “We are going to change the destiny of Brazil,” said Bolsonaro, elected president on Sunday in Brazil, Latin America’s largest nation. 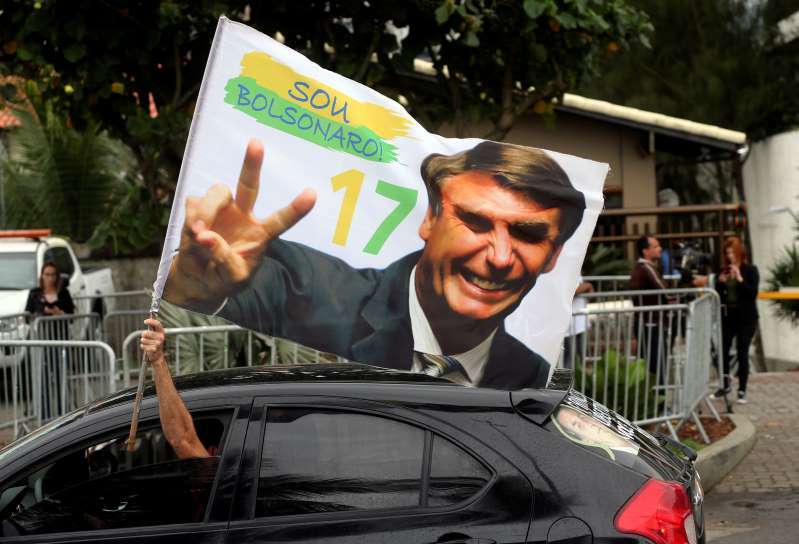 By Monday, supporters and opponents alike were posing a pivotal question: Now that Bolsonaro has won, what will he — what can he — do when he takes office on Jan. 1? Bolsonaro, analysts say, may be able to push through a surprising number of measures — if not major legislation — relatively quickly. Acting on its own, his administration could decide what kinds of books Brazilian schoolchildren read or soft-pedal environmental enforcement, as he has vowed to do. But the upending of the political class in these elections gave him not only a mandate, but a fresh alliance in Congress of evangelical, pro-gun and agribusiness lawmakers. They appear set to give him a majority in the lower house, and possibly in the senate. While not overwhelming enough to immediately push through radical, constitutional change, it could be enough for a string of new laws. Globally, Bolsonaro appears set to tilt Brazil’s foreign policy far to the right, falling in line with a growing group of nationalist leaders, including a man he has hailed as a model — President Trump. Bolsonaro has signaled his intention to follow the United States in moving Brazil’s embassy in Israel from Tel Aviv to Jerusalem. He has picked a fight with the Chinese — Brazil’s largest trading partner. Most importantly, he vowed tough new sanctions against socialist Venezuela. Most Latin American leaders have rejected the notion of foreign military intervention there, a notion floated by the Trump administration that most analysts view as unlikely. But the socialist-loathing Bolsonaro, some experts say, is a wild card. “We agreed that Brazil and the United States will work closely together on Trade, Military and everything else!” Trump tweeted on Monday, after a call congratulating Bolsonaro on his victory. Environmentalists on Monday feared the advent of an economic boom in Brazil’s globally important and ecologically sensitive lands. Bolsonaro and his advisers have sketched out plans to build power plants in the Amazon, the world’s largest rain forest, and open up more indigenous lands to industrial mining. The biggest force holding Bolsonaro back may be global opinion. His suggestion that he would follow in the footsteps of Trump and pull Brazil out of the Paris accord on climate change generated such an international backlash that Bolsonaro walked back that threat last week. But the Bolsonaro administration, experts say, could grant new licenses and interpret current laws in ways that could allow more economic activity in the Amazon — including mining. “Based on what he’s said so far, Bolsonaro’s presidency could be an environmental disaster for Brazil and the planet,” said Stephan Schwartzman, director of tropical forests for the Environmental Defense Fund. Bolsonaro has curried the evangelical vote with his vow to “defend the innocence of children in school,” claiming leftist leanings had brought teaching on homosexuality into classrooms and shunted aside traditional values. Bolsonaro is expected to tap a retired general as his education minister. Major curriculum changes would require legislation, but his administration will have broad abilities to decide on type of texts and other reading material Brazilian children read in schools. “He can’t create a class on traditional families, but of course he can, for instance, put in place a minister of education who has this content on his mind and sets the tone for what is being taught in schools,” said Lucas de Aragão, director of Arko Advice, a political-risk company in Brasilia. Bolsonaro has called on police to use deadly force to combat a record wave of violent crime and homicides. Rather than through law, he may seek to forge tactical agreements with state governors to take the leash off police — something that could lead to more deadly clashes in the short term in a country with already high rates of killings by police. He may also seek to deploy the military — as has already happened in Rio de Janeiro state — to pacify violent slums; a deal that would simply require state and federal cooperation. A pro-gun candidate, the stocks of domestic weapons manufactures have surged as Bolsonaro climbed in the polls. He says he wants Brazilians to be able fight back against criminals on their own. Experts say he is likely to have the support he needs to push through legislation that will make easier for Brazilians to buy and carry guns. One of Bolsonaro’s most controversial threats has been his vow to jail leftists. It may also be one of his most idle, at least initially. Brazil has an independent judiciary that could potentially block politically motivated arrests. Yet Bolsonaro could use his post to exert pressure and influence cases — such as when, and whether, former president Luiz Inacio Lula da Silva, the leftist who led Brazil from 2003 to 2011, gets out of prison. Lula, as he is known, is serving a 12-year sentence on corruption charges he denies. Bolsonaro has said that Lula will “rot” in jail. Bolsonaro has also said he would outlaw radical groups — such as the massive Landless Movement, which has challenged occupied rural lands. That would require congressional authority, experts say, to declare such groups terror organizations. But it is not out of the realm of possibility. Bolsonaro — a staunch defender of the former military dictatorship — tried on Sunday to appease fears that he would be an authoritarian leader. World - U.S. Daily News: How far to the right could Brazil’s new leader take the country?